To mark their 50th anniversary, The King's Singers have made it their mission to celebrate great music above all else - an aim which has driven them throughout their history. Their newly recorded triple-disc album - GOLD - completely reflects this with 60 tracks divided across three albums, themed as Close Harmony, Spiritual and Secular. What unites every track across these albums is the quality of the material. 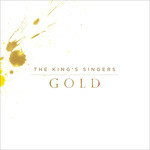 Whether ancient motets, brand new commissions or much-loved arrangements of close-harmony music from the last 50 years, The King's Singers have put together a selection of great music that reflects the extra-ordinary diversity of their repertoire.